Author: Sara Petrollino. Series edited by: Hans-Jürgen Sasse †, Mauro Tosco. This study focuses on the description of the phonology, morph­ology and syntax of Hamar, a language spoken by the agro-pastor­alist people who are known by the same name, and live in the low­er Omo valley of South West Ethiopia. The study is based on 9 months of fieldwork carried out between 2013 and 2014 in Hamar territories. Language data was gathered from 14 native speakers in Hamar villages, and it amounts to 50 texts of varying lengths and genres. While the exact classification of Hamar remains controversial, this work points out, with­out any claim of completeness, various putative links to language families and groups. The Hamar language is spoken by approximately 46,500 people (Lewis 2009). The Hamar refer to their own language as hámar aapó and they form a cultural and linguistic unit together with the Banna and the Bashada. Their languages are intelligible, but show minor variations in the lexicon and in the phonology. The commonly accepted classification sees Hamar as a South Omotic lan­guage within the Omotic family of the Afro-Asiatic phylum. Whereas there is general consensus on the genetic relationship between Hamar (including its dialects Banna and Bashada), Aari, Dime and Kara (that is, the South Omotic branch of the Omotic family), the controversy concerns the external relationships that this group of languages holds with Cushitic and/or Omotic, and at a higher level, with the Afro-Asiatic or the Nilo-Saharan phylum. The author concludes that am­biguous traits such as the Nilotic elements in the pronominal system or the Afro-Asiatic features in the verbal derivation are the vestiges of millennia of intense language contact that took place be­tween Afro-Asiatic and Nilo-Saharan. The general evaluation of this grammar is absolutely positive. The description is rich, complete and convincing. The grammar is very well written and designed in a way to respect the structural characteristics of the language. A big plus is that all the material described comes from direct collection by the author in several weeks of fieldwork in the Hamar area. 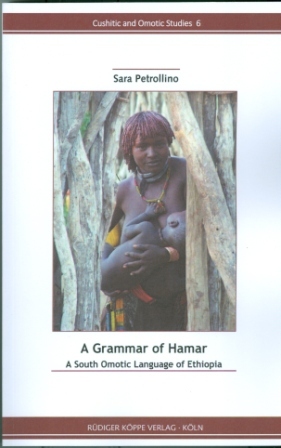 To conclude, A Grammar of Hamar definitely gains an important place among the best description ever realised on an Omotic language and in the more general context of the Horn of Africa. 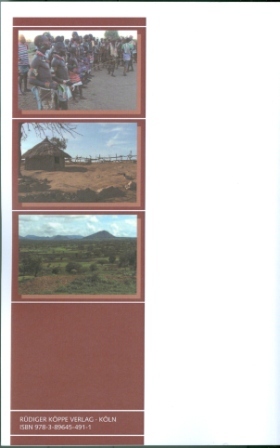 Certainly this work provides excellent data for Omotic and Afroasiatic comparativists and is successful in its primary goal: to provide a clear description of this very interesting and previously underdescribed language. The author is to be congratulated on having added to our knowledge of the least documented Afroasiatic family.